Sharme­en Obaid-Chinoy’s win makes the countr­y proud. For Pakistan, 2012 could not have started on a sweeter note. If Sharmeen Obaid-Chinoy scoring an Academy Award nomination for her documentary Saving Face in the category of Best Documentary (Short Subject) wasn’t good enough, then her getting to take home the Oscar this Sunday night at the 84th Academy Awards presentation, definitely was. With the entire nation rejoicing at her victory, it seemed she had won the Oscar for all of Pakistan. Obaid-Chinoy is the first Pakistani to receive an Oscar and hopes to screen her award-winning film at local schools, colleges, universities and communities to raise awareness about the victims of acid violence. Saving Face will air on HBO on March 8 in the US. According to a press release, Obaid-Chinoy has produced 16 critically acclaimed films, all of which have been aired internationally. Detailing the work of a British-Pakistani plastic surgeon, Dr Mohammad Jawad, Saving Face chronicles the doctor’s travels across Pakistan as he performs reconstructive surgery on survivors of acid violence. Being one of the cruellest forms of violence and abuse, acid attacks are underreported in Pakistan but still, at least 150 cases are filed every year. Obaid-Chinoy’s documentary highlights the struggles and endurance demonstrated by these abused women despite their difficult circumstances. The film was shot entirely in Pakistan, mostly on the Seraiki belt, in addition to Rawalpindi, Karachi and Islamabad. Walking the red carpet with her husband Fahad Chinoy, Sharmeen wore custom Pakistani couturier Bunto Kazmi’s creation with jewellery exclusively designed by Kiran Aman of Kiran Fine Jewellery. She kept the Pakistani spirit alive by also putting on an ensemble by leading fashion designers Sana Safinaz with exclusive jewellery by Sherezad Rahimtoola for the Oscars after-party. Published in The Express Tribune, February 28th, 2012. Obaid-Chinoy’s documentary is the story of victims of acid violence. Designers extend their artistic support to Pakistani Oscar nominee Sharmeen Obaid-Chinoy. Twitterati congratulates Pakistani filmmaker Sharmeen Obaid-Chinoy on winning an Oscar for Short Documentary. Great Job Pakistan. From a country burnt and destroyed, comes a marvel. Good Luck Pakistan. I am surprised by everyone “Proud of Pakistan for wining the Oscars”. Sure its a great personal achievement of the Director Sharmeen Obaid Chinoy, But as Pakistani the predominant feeling should be of shame. Shame of living in a country where Acid attacks are routine. Shame for the fact this is the only way Pakistan gets press in the world. Being proud of this makes almost as much sense as German person feeling pride on “Schnidler List” wining the Oscar. As for the Director I sincerely hope she once her life highlights something positive about this wretched country. Of course her work is in English and never been aired in Pakistan. Her other works include: Pakistan Double game,Reinventing the Taliban,Terrors Children, Lifting the Veil, Pakistan Taliban Children, Transgender: Pakistan Open Secret. Looks lot like Paksploitation Cinema. So does this mean that America is no longer a filthy oppressive zionist land? Phew! Sharmeen has won the Oscar Award but the question is will the people who through acid on women faces will stop throwing the acid? Will it benefit for the society? Will it change the mental state of the sick men not to perform such act of brutality? Will it shake the conscious of people who are involved in such a heinous crime? Still Sharmeen has to do a lot of work after winning the Oscar Award. She should step forward and go in the remote and far flung areas of the country, where such ugly incidents occur time and again. May Al-Mighty Allah save the women of Pakistan from such people who despite being human beings but act inhumanly. Ameen. Excellent job – goes to prove that rather than hiding issues your better off putting them under a spotlight so you can fix them. Acid is readily obtained in Pakistan because it is a product widely used in the nation’s dominant textile industry. 100 acid attacks are reported every year in Pakistan but many more go unreported. The attacks are often done in violent retaliation by a rebuffed suitor or a would-be marriage partner. In Baluchistan where acid is not readily available recently the perpetuators buried three women alive and shot dead two others. The reason for doing so is known to punish the three girls, aged 16 to 18, for trying to decide their marriages. I am proud of spirit behind the work sharmeen is doing, and so am proud of all those like Sharmeen fighting to for the right. So, lets see this as a new start, and thank Sharmeen for giving us a great one! it is’nt helping presenting soft image of pakistan rather a cruel nation, such an issue should have been raised at government level and policies and planes should have been made to avoid such disturbing acts in spite of showing all the world. such a shame!! Job is done by Sharmeen to show on world’s stage what is going on in this society. It is now Pakistanis job to correct the wrong doings. Putting these issues under the rug, so that Pakistan will not get anymore bad name is not wise. I am surprised to read some of the comments here about how wrong it was to make this documentary as it shows Pakistan in a bad light and so on and so forth. I wish people stopped this hyperpatriotic nonsense and looked at things from the victims’ point of view. These women are wronged by the men they trusted, married, had children with or in some cases were ‘loved’ by them and then were mutilated because of whatever twisted reasons or thoughts those men were harbouring. Sharmeen Chinoy has dared to expose their plight to the entire world and that should only be commended and not criticised for the wrong reasons. All these fellow pakistanis who are getting their knickers in a twist about Pakistan’s reputation should just think how they would feel if they had acid thrown onto their faces! The pain, the horrible, immense pain, of the acid burning on to your face and eyes, of losing face (literally! ), of losing trust, of living in fear, of never being able to look at themselves in the mirror without cringing, of watching others cringe when they look at them, pain of being left alone and I can just keep adding to this list of loss and unfairness. And then there are people like Dr Jawad, like Sharmeen Chinoy who step forward and tell the world that this needs to stop, and tell those poor women that they have a voice, that they dont have to suffer in silence because we know that they are suffering. Would you not want that if you or your loved one was a victim? Shame on you lot who lack all ability to empathise…shame on you! To those who think she only portrays a negative image of Pakistan in her films, wake up… she is portraying the truth. You and I both know that people suffer from acid attacks in Pakistan and there is a general reluctance to acknowledge this, let alone do something about it. Rather than showing the beautiful mountains or whatever good image of Pakistan some of us want portrayed, Sharmeen has shown something that could wake up the nation, policymakers etc into actually doing something to counter a real problem… not the superficial image problem Pakistani tourists and expats face when dealing with foreigners. It is the Muslim woman who will liberate Islam and drag it to the twenty-first century willy-nilly! What you and your fellow social entrepreneurs are doing in Pakistan’s unhealthy culture of complaints is truly inspirational. Let’s hope others will follow in your footsteps to light candles and not just curse darkness. What a forgetful nation we are…!!! While rejoicing Ms. Chinoy’s victory for being awarded Oscar after 84 years, we have completely forgotten PPP’s MPA Waheeda Shah’s episode of slapping a teacher (A woman slapping a woman). So much for “saving face”…!!! I would like to ask why hasn’t any feminist NGO taken up the issue so far??? Indeed, some marks take more time to heal than acid burns…!!! Oscar awards on foreign films are just a tool that is used for foreign policy reasons. United States either trying to mend differences or have some aggressive future plans with Pakistan…It is always helpful to keep a lid on premature exhuberence – just a thought! Proud of her…but not feeling proud to be a Pakistani…the world only knows us as acid throwing terrorists! Indeed a great news for all of us. Were you aware that acid attacks take place in Pakistan? If yes, did you do anything at all about it (individually or as part of a collective movement)? I think some of the comments are unrealistic and unnecessarily criticize Sharmeen. Please treat her as a film maker and a communicator par excellence, which she is without any doubt. We all know that film making is an art and means of communicating the desired themes. In case of her film “saving face” she has very effectively communicated a gruesome aspect of acid throwing in our society. This does not mean that other cultures do not have the skeletons in their cupboards. E.g. 50% of the children born to women under 30 years of age in USA are illegitimate. Horrifying, is it not disgusting for a society which is suppose to be most organized and great proponent of morality? Statistics reflects Stone Age family structure. But healthy societies do not perpetually indulge in breast beating. They identify the weakness and communicate it to the people at large, with the purpose of shaping right values and attitudes. This is what the purpose of film is all about. Nonetheless Sharmeen has made us all proud and set a pace for film makers of Pakistan to follow her suit. Obviously referring to the United States, Hasan Zaidi, a journalist and film-maker enthusiastically said, “You can knock us down and watch us bleed but you can’t keep chains on Pakistanis”. Somehow Mr. Zaidi missed the point that it is Americans, by awarding the Oscar to Obaid-Chinoy’s documentary, are willing to appreciate a work of art in spite of the fact that the recipient of the award is a citizen of a country – Pakistan – known for its blatant hostility towards the United States. I wonder if there is any institution in Pakistan capable of impartiality and open-mindedness shown by the the 84th Academy Awards. More importantly, the documentary highlighted the oppressive attitude of society in Pakistan towards women and how it keeps women in chains (using Mr. Zaidi’s words). Sharmeen…..Congratulations!!! Those who are scolding Pakistan should be aware that it is illiteracy which breeds such vices in society.One may scold politicians who kept the nation illiterate over the past 64 years.Let the entire nation & in particular politicians learn from the message our,” Pakistan’s”Sharmeen has conveyed.Lots of prayers & Good Luck Sharmeen,we are,Pakistan is, proud of you!!!! @Ali Wazir: Sorry Ali, but I vehemently disagree with you. Documentaries generally do focus on societal woes, and this film is no different. Pakistanis should be proud of her achievement, and allow the subject matter to resonate and change behaviors as a result. This is a classic case of bitter-sweetness. We are happy but we are unhappy. Nonetheless, you completed Iqbal’s definition of Shahee as an individual. She won a oscar but the shameful thing is what has ur country done about domestic violence against women n young girls? Shame on u pakistanis for supporting such a corrupt govt! @Najia H Khan We both know that most of our pakistanis are paranoid by birth. Always looking into conspiracy theories. But thanks for saying what you said. All this fake pride and brushing things under the rug serves no good. When Frontline makes documentaries on Chicago’s gang violences or the American methamphetamine trade we don’t say, “oh look, american exploitation documentaries”. Documentaries are meant to be hard hitting and touch on the corners that are both provocative and thought inducing. She herself says that she wants to bring about a discussion and change on the uneasy aspects of Pakistani society. So is this going to be fifteen minutes of fame and back to business as usual? Where is publicity hogging politicians? How come no politician is coming forward and saying that the sale of acid will be limited to person with photo ID and a picture would be taken of the customer along with address? As a rule it should not be sold to anyone under the age of 30 etc. Well done… you have made us proud…. u have highlighted a very important and sensitive point and God bless you…. Not a really “enlightened” comment seriously…. Shocked by some of the negative comments , goes to prove we pakistanis are a nation of depressed people with a drag you down with me mindset. This is an achievment of such a large scale and by a young Pakistani woman who could have easily chosen to live a cushy life as an expat abroad. Those people who feel ashamed that these issues of pakistan were highlighted on an international scale need to wake up and smell the coffee, for these are real issues and what you need to be ashamed of is that they exist in pakistan not the fact that Sharmin has done a huge public service by creating awareness. any other country people would have rejoiced, such a shame that when Pakistan has a reason to show pride and happiness we as a nation nitpick and bring people down. Congrats Sharmeen, you have made us proud and highlighted a very serious and barbaric problem. I hope more Pakistanis take up issues like this and create awareness among the common people. By showing negative image of Pakistan winning Oscar. Shame on you Sharmeen Obaid. @Hk-29: I am indeed proud of her achievements and it shows the world that Pakistan wants to end violence against women. Incidentally there are more acid attacks against women in India and Bangladesh so women everywhere should celebrate highlighting women’s issues. As for your snide comment against Pakistanis and terrorism, you should know that Iran, Arab nations, Central Asian Chechens and Nigerian Muslims are perhaps more tainted with the accusation of being terrorists than Pakistanis but that shouldn’t dissuade any Muslim from working to better society! Some supports of Sharmeen who are tiredlessly claiming that Sharmeen has touched other topics as well, can those guys tell why on earth she got an award on a controversial movie like Children of Talibans but not on others. Can those “Experts” come up list of all his work which touched issues of Kashmir,Iraq and Israel occupation and awards she received against them? 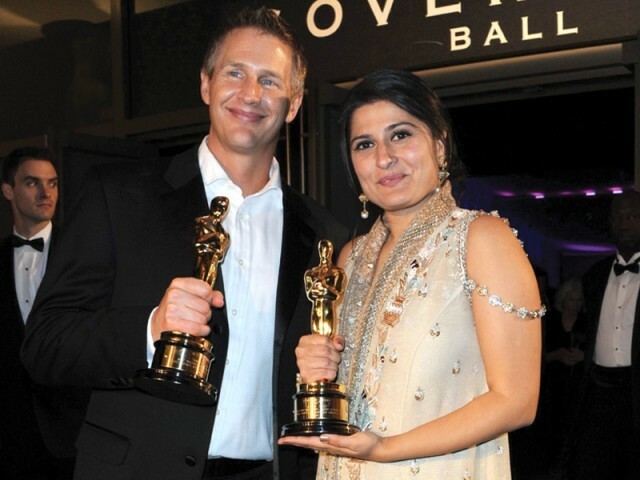 The other Pakistani directors who make substandard and stereotyped films must have to learn the lesson from Sharmeen Obaid Chinoy because she has proven her ability and hidden talent and the biggest internationally recognized award “Oscar Award” she got. Well its a good news for the film making in Pakistan and courageous representation. So many social evils are going unreported in India and Pakistan for fear of establishment or social stigma. I have seen a Pakistani film BOL recently about a daughter of a cruel father fighting for her young gay brother. I almost cried after seeing that film. It was an art of crisp story telling. I expected that to was worth the Oscar had it been noticed. Credit must go to doctor Mohammed Jawad too who has upheld a wonderful humanitarian cause! Wish him all the more success in his endeavour ! I am proud that this award is for the sub continent and we share your joy so that it will enhance multifold ! Congratz to Sharmeen and Daniel Jung for making such a powerful film and highlighting issues our women are facing in our country! @yavi: I hope this is an absurd allegation . Do you have a link to substantiate your statement? Or should it be moment of collective shame? What is to be proud of when someone holds mirror to your ugly face? Many in India were upset with what was depicted in Slumdog Millionaire. But that is the truth although it may have been dramatized somewhat for effect as happens in every film.